Frontera! 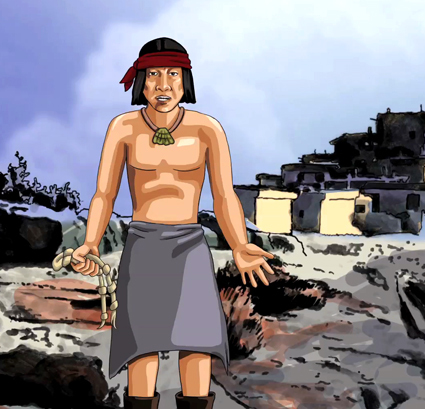 Revolt and Rebellion on the Río Grande is an animated documentary retelling the history of the first colonial entradas in what is now New Mexico and Arizona, Spanish reconnaissance and settlements that have marked the US-Mexico borderlands even today. 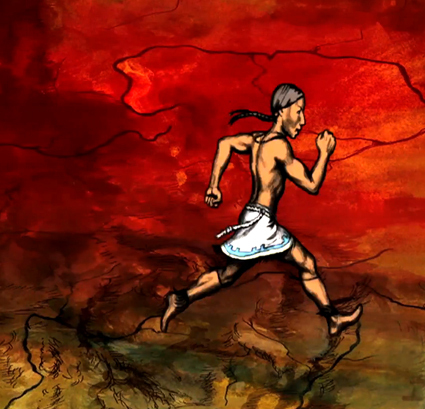 With animated characters and a documentary sensibility, Frontera! narrates unresolved historical moments when the Pueblo people orchestrated the unthinkable: a pan-Indian uprising successfully expelling its occupiers from the entire Rio Grande region leading to an indigenous cultural and social renaissance. Frontera! 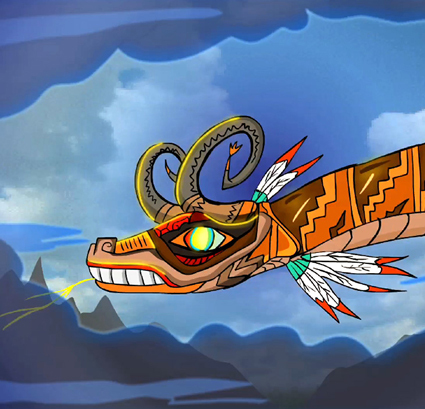 begins in mythic time with a horned serpent (Awanyu) as central witness to the history of the land. The snake, or serpent god, is a sacred figure found in various North American mythologies associated with waters, rivers, lakes, lightening and thunder. The horned serpent is a life giver. When the snake is not present, ecological balance and the social world are thrown into chaos. It is with the snake’s absence that the Spanish colonial project to El Norte is mired in violence, slavery and terror bringing the upper Río Grande indigenous communities to the brink of devastation. On the heels of Estevanico’s confrontation with the Zuni came a series of violent entradas – Spanish expeditions into a “new” Mexico in search of wealth, power and converts to Christianity. 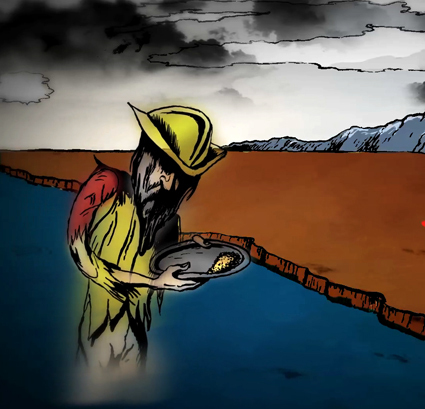 The animation second and third acts follow the triumph and failure of two conquistadors: Francisco Vásquez de Coronado as he attempts to conquer the Cities of Gold that, ultimately, only exist in the colonial imaginary; and, Don Juan de Oñate, who assembles another expedition to settle New Mexico in search of gold, silver and souls. Both Coronado and Oñate end up banished from New Mexico but whose legacies of violence still remain. The forth act shifts to a rap song and narrator who rap about the vision of a Pueblo spiritual leader named Po’Pay. In 1675, Po’Pay is arrested and whipped in Santa Fe for practicing “witchcraft” and, upon release, retreats to a Kiva in Taos to begin a long process of negotiating and organizing a plot to revolt against the Spanish with thirty diverse Pueblo tribes who spoke different languages and, in many cases, held enduring resentments. On August 9, 1680, the Pueblos revolt in a coordinated attack, defeating and ousting its occupiers from the Rio Grande region. The Pueblos destroyed the mission villages established new refugee communities in ancestral sites initiating a cultural renaissance that still lives on today. 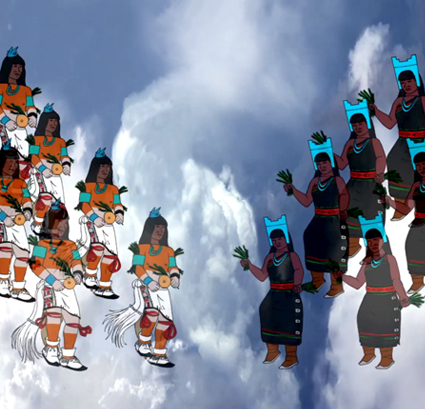 John Jota Leaños (Producer) is an award-winning Chicano new media artist using animation, documentary and performance focusing on the convergence of memory, social space and decolonization. Leaños’ animation work has been shown internationally at festivals and museums including the Sundance Film Festival, the Morelia International Film Festival, San Francisco International Festival of Animation, the KOS Convention 07, and the Museum of Contemporary Art, San Diego. Leaños has also exhibited at the 2002 and 2008 Whitney Biennial in New York, the San Francisco Museum of Modern Art, Museum of Contemporary Art in Los Angeles, and Massachusetts Institute of Technology. Leaños is a Guggenheim Fellow in Film (2012), Creative Capital Foundation Grantee and has been an artist in residence at the University of California, Santa Barbara in the Center for Chicano Studies, Carnegie Mellon University in the Center for Arts in Society, and the Headlands Center for the Arts. Leaños is currently an Associate Professor of Social Documentary at the University of California, Santa Cruz. DVD copies of this program are not yet available.